Below mentioned are the steps to verify e-filing using Electronic verification with the help of Electronic verification code generated through Bank ATM. Please note that this facility is available to you if your ATM card is linked to PAN validated bank account and the bank is registered with Income Tax Department to offer EVC service. Step 2: Now, insert &authenticate your ATM card using ATM PIN that will allow you to select the “Generate EVC for Income Tax Return filing” option on the ATM Screen (this is a new option and will be available at ATMs of specified banks). Step 3: After this, bank will lodge a request with Income Tax Department E-filing website to generate EVC. The generated EVC will be sent to your registered mobile number with e-filing. 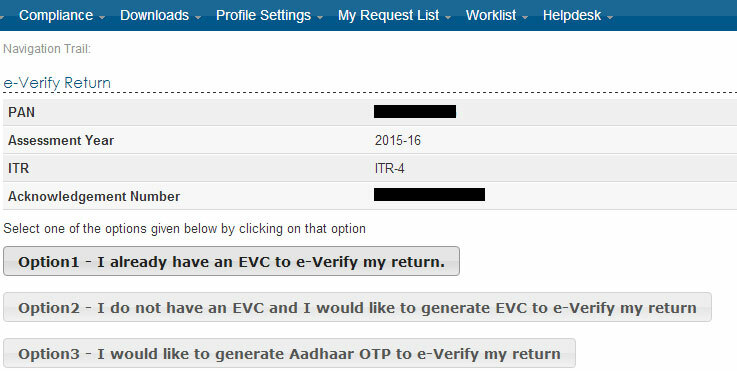 Step 5: Click on ‘e-Verify’ link to e-Verify the return as per Figure 1. Now, you will see three options as given in Figure 2 if you have already filed the return and the same has not been verified yet. Step 7: Now, enter the EVC that you received through Bank ATM and click ‘Submit’ (Figure 3). Step 8: You will see success message as shown in Figure 4. Now, download the acknowledgement. This completes the electronic verification of e-filing using Electronic verification code generated through Bank ATM.